There is nothing that brings me more joy than giving a thoughtful and personalized gift. I have some very special friends that I wanted to send a thank you gift to, and one of their favorite things to do as a couple is to prepare and eat pancakes together on a lazy Sunday morning. To express my appreciation to them, I put together a pancake breakfast box with my favorite chocolate chip pancake recipe, all of the dry ingredients, syrup and my favorite kitchen supplies to share with them. One of the things I most admire about this couple is that they work so hard during the year giving up all their weekends as wedding designers and planners, so when they do get a rare weekend off, it is all the more special to them. I chose to brand the gift box in the colors that the couple love which include taupes, white and gray. I wrapped the glass syrup bottle in a linen pouch and the other items in white and kraft tissue paper. I brought out my ribbon collection and added velvet and silk ribbons to add texture. To give this gift a personal touch, I had one of my colleague's design a recipe card that I printed on white card stock (recipe below) and put in a kraft envelope inside the box. 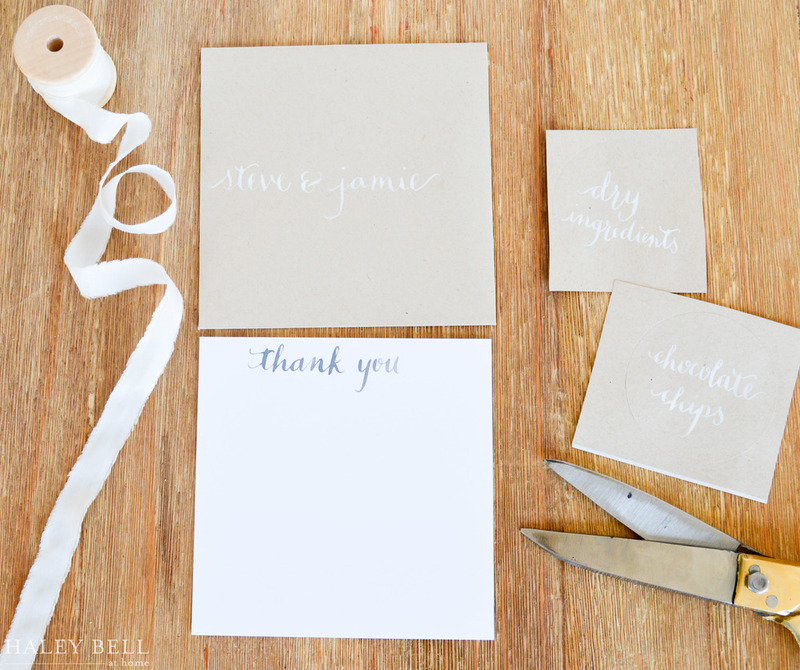 Additionally, she hand lettered calligraphy onto the kraft jar labels in white ink and gray ink onto a thank you card. This really made the gift come together. Once I had sourced all of the items, I added all of the dry ingredients to one of the glass jars (recipe below) and the mini chocolate chips to the other jar. I then wrapped all of the items individually with tissue paper and ribbons since I had to mail this gift. If you were going to give it to someone in person, you could wrap it in a cute mixing bowl, gift basket or gift box. Having a lazy Sunday is hard to come by for this couple, but I hope this gift inspires some R&R and made them feel as appreciated as they are. Whatever the occasion is that you are looking to give a personal gift, it's as simple as finding what the recipient truly loves, and allowing that to take shape into a gift. In a large bowl, whisk the eggs with a fork. Whisk in the milk mixture. Add the dry ingredients (included in jar) and mix just until barely blended. Add the chocolate chips (included in jar) and mix. Heat butter on a griddle over medium heat and ladle 3 tablespoons of batter for each pancake onto the hot surface. Cook until bubbly on the top and golden brown on the bottom. Serve and enjoy!